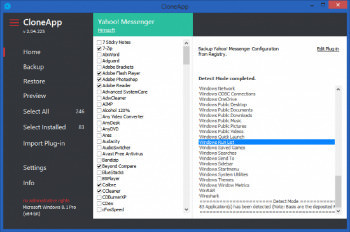 CloneApp is a backup tool that is designed to back up a variety of program configuration files as well as application settings that stored in the registry. This includes many popular third party programs as well as various Windows options like Account Pictures, Favorites, Saved Games and more. CloneApp currently supports several dozen popular software products (commercial and free) and support for additional applications will be added in future releases. – Function for wildcard support in “BackupFolder” command is again enabled. Format “Folder*”, e.g. BackupFolder=Version2018. *|Version2018 (supports wildcards). It supports also phrases in format “*Folder*, e.g. BackupFolder=*Version*|Version and also files. – Optimized “BackupFile” command (Added support for all file types with same filename, e.g. BackupFile=Config. * (This could be a .TXT, .INI etc. file). All file types would be backed up. – Added new feature to Reset application settings, files and data specific to the application to factory defaults. If enabled (right-click on Apps window > Reset), a new context menu will appear which allows you to Delete (right-click again on Apps window > Delete) application configurations (ONLY for selected App). – Program Icon file is loaded dynamically from Data folder of CloneApp. The .EXE file itself weighs ~ 600kB less In this context, a issue has been fixed that caused on some system constellations (particular Windows 7 environments. The System finds a problem for which it has no error message, it simply says “Application has stopped working”) that CloneApp could not start.